Obtain a source count rate. Obtain a rough spectral slope. Consider galactic NH absorption and pileup. Select the operating mode and telemetry format. We also need to prepare and submit a properly completed proposal to observe this object. 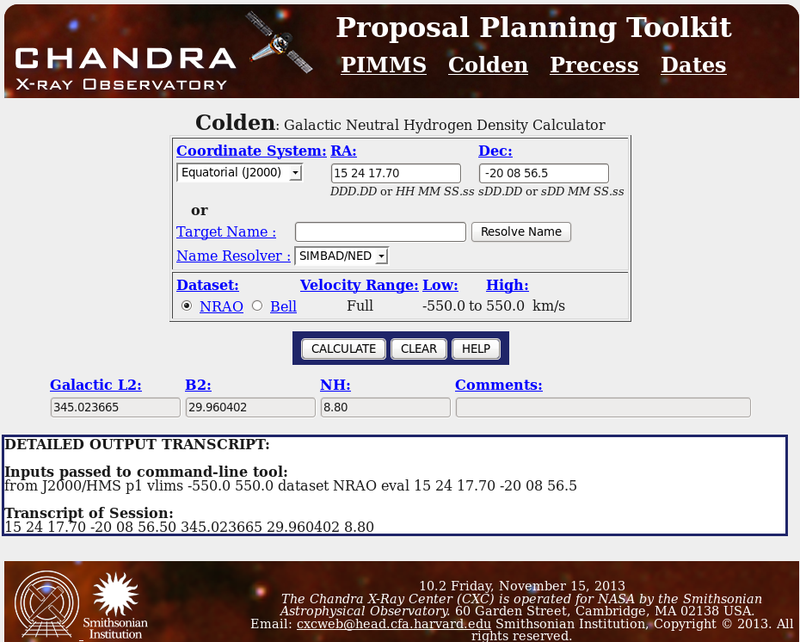 See the Proposer Pages for more information about Chandra Proposals. If the target has already been observed, additional observations must be justified (variability, longer exposure, etc.). 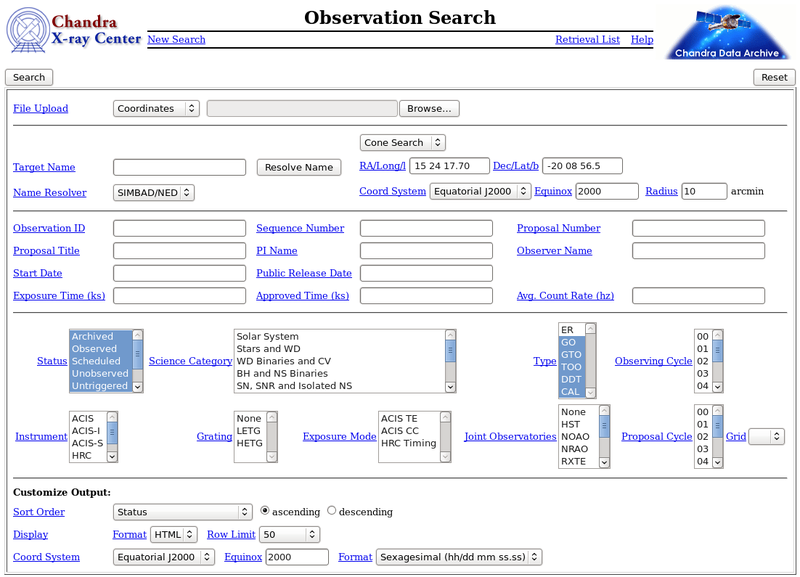 To determine if any previous observations exist, you can use WebChaSeR, available at http://cda.harvard.edu/chaser. Enter the RA and Dec of the object. The source 1RXS J152417.7-200856 is at RA: 15 24 17.70 and Dec: -20 08 56.5. Verify that the four "statuses" in the Status box are highlighted: Archived, Observed, Scheduled, and Unobserved. The screen is shown in Figure 1. Click the Search button. There are no observations returned, so there are no other Chandra observations to consider in this proposal. ObsVis is a tool to aid in observation planning which allows the inspection of sky images with overlaid instrument fields-of-view (FoV). ObsVis interfaces with the SAOimage DS9 image display tool. ObsVis is available as part of the CIAO software or as a standalone software package. If you included ObsVis when you downloaded and installed CIAO, start CIAO and type "obsvis". If you do not have CIAO, download the standalone ObsVis. turn on desired chips using the toggle buttons on the right hand side of the screen. 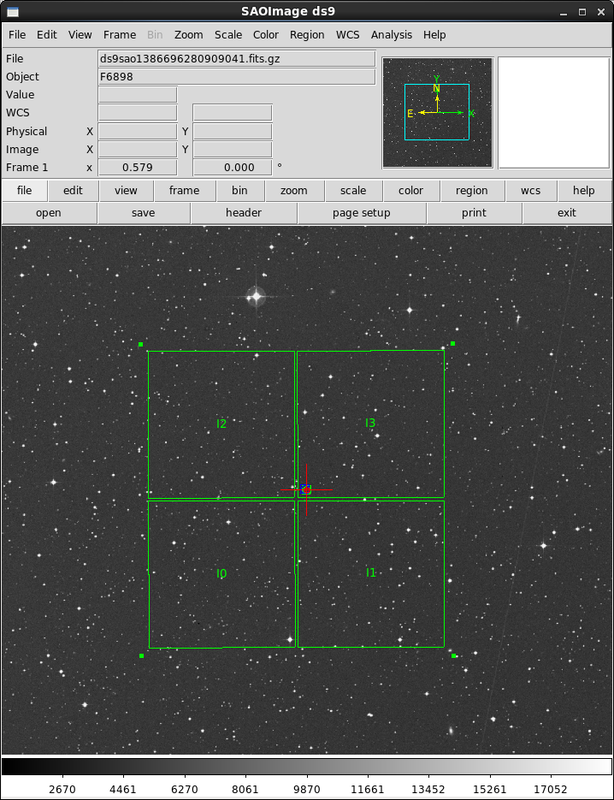 The Digital Sky Survey image for the region around 1RXS J152417.7-200856 will appear in a DS9 window. The resulting sky image with chips I0-I3 is in Figure 3. Turn on desired chips using the toggle buttons on the right hand side of the screen (see Optional CCDs for suggestions on optional CCDs).The instrument FOVs can be adjusted from the obsvis window or by directly manipulating DS9. 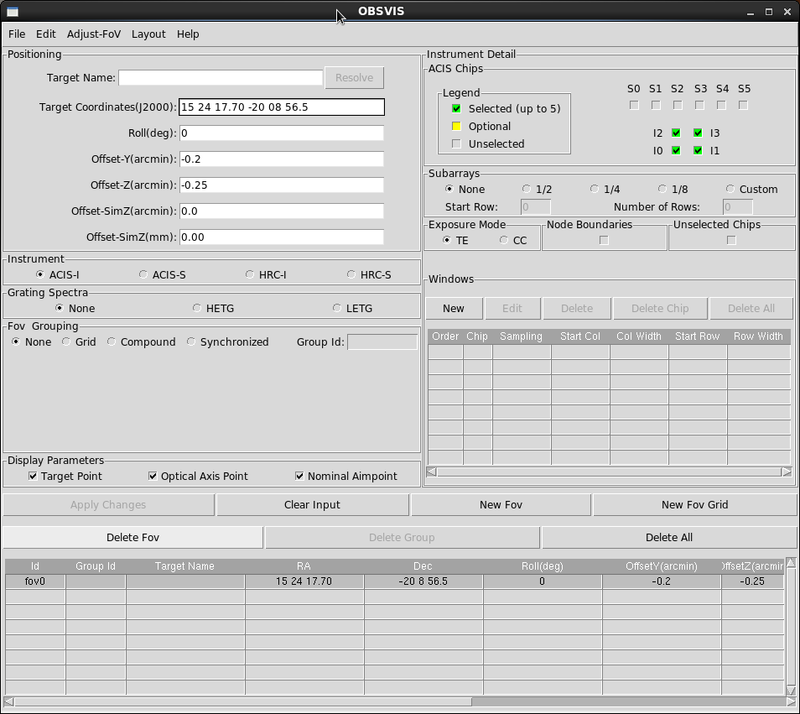 A screenshot of the main Obsvis window. A screenshot of the Obsvis Field of View in a DS9 window. To check for X-ray sources, navigate "Analysis --> Catalogs --> High Energy --> Second ROSAT PSPC" within DS9. No sources should be within the ACIS FOV. There are no other strong sources in the field of view, as shown in Figure 3, so a roll constraint is not required. Planning an observation with Chandra is complicated by the fact that the maximum exposure time for a given target depends on the solar pitch angle (i.e. the angle between the viewing direction and the direction to the sun). Pitch angle restrictions are described in detail in the POG. The pitch angle of a celestial source changes throughout the year. Therefore, the maximum exposure time might also change througout the Cycle. There may be times when it is impossible to schedule a particular target. Proposers who require time constraints should use the PRoVis tool to check that the constraints are feasible. Please see threads on time constrained observations and how to classify constrained observations. The exposure time for this target is very short and the observation is not time constrained. Therefore pitch angle restrictions are not important for this proposal. A screenshot of ProVis showing roll, pitch and visibility. One factor that will affect the exposure time needed to detect this point source is the amount of galactic Nh absorption in the direction of 1RXS J152417.7-200856. The tool COLDEN can be used to determine this amount. More information about this proposal tool can be found from the CXC Proposer page and the colden ahelp. For the case of 1RXS J152417.7-200856, we will use the web version of COLDEN at http://cxc.harvard.edu/toolkit/colden.jsp. Use the pull-down menu to select the J2000 coordinate system, and enter the source coordinates in the RA and Dec fields. Click CALCULATE. The result is a galactic Nh of 8.8e20 cm-2 in the direction of the source, as shown in Figure 5. Use PIMMS to determine the predicted Chandra count rate from the ROSAT/PSPC count rate. PIMMS will also calculate the ACIS pileup. PIMMS is appropriate for sources with simple spectra. The web version of PIMMS is at: http://cxc.harvard.edu/toolkit/pimms.jsp . Select the following values for the PIMMS Input fields. Select the following values for the PIMMS Output fields. We have chosen to use ACIS-S. This is because we are working with a ROSAT source, and ROSAT has a lower energy bandpass than Chandra. ACIS-S includes two Backside-Illuminated (BI) chips, which provide better low-energy response compared to the Frontside-Illuminated (FI) chips. This is illustrated in chapter 6 of the POG. To estimate a Chandra count rate from a ROSAT count rate, it is necessary to assume a model for the source's spectral energy distibution. Since this is unknown in the Chandra bandpass, we will calculate the count rate for two common models, a Power Law model with photon index = 1.0, and a 5 keV Bremsstrahlung model. For the Power Law model, select the following fields. Select these fields at the bottom of the screen. Click CALCULATE. Shown in Figure 6 are the PIMMS results for the Power Law model. PIMMS predicts an ACIS-S count rate of 0.3010 cts/sec with 33% pileup. PIMMS also calculates a background count rate of 2.4e-5 cts/sec. A screenshot of the PIMMS results for the Power Law model. For the Bremsstrahlung model, use the same values for the Input/Output fields and adjust the model parameters. For this model, PIMMS predicts an ACIS-S count rate of 0.1909 cts/sec with 22% pileup, and a background count rate of 2.4e-5 cts/sec. The PIMMS results show that 1RXS J152417.7-200856 is likely to be affected by ACIS pileup. Pileup results when the count rate is so high that two or more photons are detected as a single event. Pileup and pileup mitigation are discussed in the ACIS chapter of the POG. Since 1RXS J152417.7-200856 is expected to be a point source, selecting a subarray is a good approach for reducing pileup. When a subarray is selected only part of the chip is read out, allowing for a shorter integration time. The frame time for standard subarrays is also provided in chapter 6 of the POG. For example, for the default 1/8 subarray on ACIS-S with one chip turned on, the CCD is exposed for 0.4 sec per frame instead of 3.2 sec per frame. The shorter frame time reduces the probablity that two or more photons will hit the same detect region in a given frame interval. What is the pileup fraction for a 1/8 subarray using a single chip? Using the Bremsstrahlung model, enter 0.4 in the PIMMS Frame Time field and click CALCULATE. New PIMMS results in Figure 7 shows that the pileup fraction is now reduced to 3%. A screenshot of PIMMS results for the Bremsstrahlung model. A pileup value of 3% is acceptable for many scientific purposes. If one of the science objectives is to carry out a detailed spectral fit, you might need to reduce pileup still further, for example, by using Continuous Clocking mode. It is desirable for spectral analysis to minimize pileup because some low-energy piled photons can be erroneously cast to higher energies, which distorts the spectrum. In this example we are assuming that 3% pileup is acceptable. To calculate the exposure time required to detect the source, we will use the values determined in the previous section for the 5 keV Bremsstrahlung model. The minimum allowed requested exposure time for a Chandra observation is 1 ksec. This gives a total of 0.191 cts/sec * 1000 sec = 191 counts. The corresponding signal-to-noise ratio is 191/sqrt(191) = 13.8. Background is ignored here since there are only 2.4e-5 cts/sec * 1000 sec = 0.0024 background photons within the point source region. With a total of 191 counts, it will be possible to get a rough spectral slope. If a spectrum is required, the total number of detected counts should be at least about 1000, which would increase the exposure time to 5 ksec. For the purpose of filling in the RPS forms, we will assume that a 5 ksec observation is sufficient to achieve our science goals. It is important to estimate the TOTAL count rate for an observation to check that telemetry limits are not exceeded. The total count rate is also important for selecting ACIS Exposure Mode and the Telemetry Format. The total count rate includes the target source, any other sources in the field, and the background. We have already confirmed using ObsVis that there are no other known sources in the field of view. It is unlikely there would be, since we have elected to use a single chip with a 1/8 subarray. Therefore, the total count rate for our observation is the target source + the background. To estimate the background, we need to know which ACIS-S chip is used. We have selected the BI chip S3. In calculating the total field count rate, we need to consider all contributions to the background. Estimates of the background as a function of energy band are provided in the ACIS total background section of the POG. Table 6.10 gives the total background rate for the S3 BI chip to be 12.5 counts/sec/chip, for the upper energy cutoff of 15 keV. Since we are using a 1/8 subarray, our total background rate is 1/8th of this count, or 1.5625 counts/sec. Using the source count rate we calculated earlier, the total field count rate is 0.191 + 1.5626 = 1.7535 cts/sec. Available ACIS operating modes are Timed Exposure (TE) or Continuous Clocking (CC). These are described in the ACIS Operating Modes section of the POG In CC mode, one spatial dimension is lost. Because one of our science goals is a source detection and location, TE mode is the most suitable. ACIS Telemetry formats are described in the ACIS Telemetry Formats section of the POG. Choices for TE mode are Very Faint, Faint, and Graded. The telemetry formats differ in that they provide different amounts of information for each event. The Very Faint format provides the most information, followed by Faint, and then Graded. Each format has a different maximum count rate, or telemetry saturation limit, with Graded format having the highest. When selecting the telemetry format, you need to consider the tradeoff between the event information provided and the required maximum count rate for your field. The total field count rate for our observation is 1.7535 cts/sec. All of the ACIS telemetry formats would accomodate this count rate. Therefore, we select the Very Faint format for our observation, since this provides the most information about each event. Since we have decided to turn on just one chip, we do not need to consider whether any chips should be optional. For more information on this issue, please refer to the ACIS chapter of the POG. For general instructions on how to submit a proposal, please see the "Using RPS to Prepare and Submit a Chandra Proposal" thread. The RPS target form should have the following parameter values for this observation. If a parameter isn't listed here, for example, Y Detector Offset, use the default RPS value or leave the field blank.